Ten years ago, nineteen year-old Quincy Carpenter was the lone survivor of a grisly mass murder that took place at a cabin in the Pennsylvania woods. She now lives in a tony NYC neighborhood along with her lawyer boyfriend and has a successful baking blog. Quincy also has the unwanted distinction of being a “Final Girl”, the name awarded her and two other lone survivors of similar ordeals. She would like to put the past behind her and shake the media’s obsession with her and her title but so far she has been unsuccessful. Though she missed a televised opportunity at meeting the two other “Final Girls”, she has spoken to one at length over the phone. When one of the girls turns up dead of an alleged suicide and the other girl shows up outside Quincy’s apartment, her life takes a dramatic turn. She invites this girl, seemingly with no place to go, to stay with her. Quincy has been unable to remember most of the details of that fateful night, other than how she was rescued by a lone police officer, the one cop who believes her story and has been a source of support all these years. Now, the other surviving Girl is pressing Quincy to remember that night. Flashback scenes of that night intersperse present day as the story slowly unfolds, bit by bit. 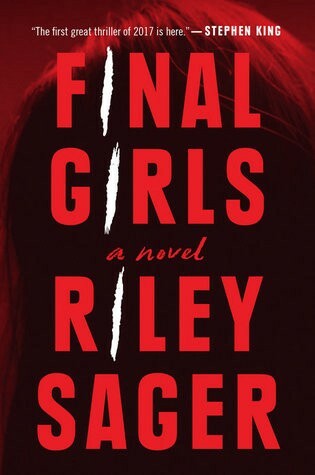 As Quincy begins to recover small fragments of her memory, her world turns upside down and she begins to discover disturbing secrets about the other “Final Girls”. The more she digs, the more her life is in danger. Her lack of memory is the only thing keeping her safe. The suspense and tension mount for an ending you won’t see coming, at least I didn’t. Strange behaviors seems to be easily explained and Sager has the unique ability to divert reader attention so that the real mystery stays veiled until the shocking end.